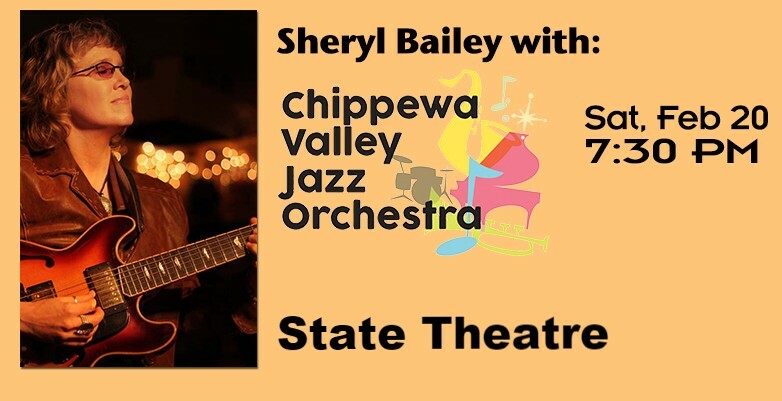 When the Chippewa Valley Jazz Orchestra (CVJO) performs on Saturday, Feb. 20 at 7:30 p.m., jazz guitar legend Sheryl Bailey will not be the only musician joining them on stage. The first half of the show will feature the best High School jazz musicians from five counties and more than 10 schools. The students will not only be performing with the CVJO, they will also get to learn their craft from seasoned professionals in a day-long workshop. This is the fourth year for the CVJO to work with high school jazz musicians. CVJO Board President Geoff Peterson says, "The CVJO works with young people because we firmly believe that they are the future of jazz. We want to help them understand that a jazz is the one true American art form, and it is not just history, but something that is alive and growing even in the 21st-century." When asked why Sheryl Bailey was chosen as the featured performer Peterson says, "Not only is she a tremendously gifted performer and the recipient of an enormous stack of awards for her playing, but she is also a dedicated jazz educator who has worked tirelessly to do many of the things that we as an organization hold most dear in terms of youth jazz education." Jazz fans will get to see Sheryl Bailey's full prowess when she takes the stage with the CVJO in the second half of the performance.